The Northeast Ohio Areawide Coordinating Agency (NOACA) is the metropolitan planning organization (MPO) for the Cleveland Ohio metropolitan area. As an MPO, NOACA is responsible for all of the transportation planning in their five-county region. 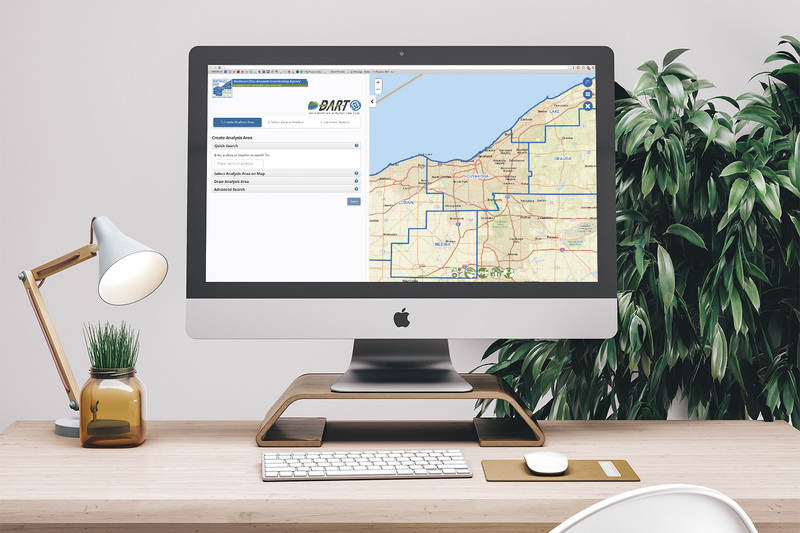 Tierra Plan was hired to design and develop a custom web map application that includes a suite of scenario planning and reporting tools with a back-end geodatabase. We presented this innovative project at the Esri International Users Conference in San Diego. The project involved analyzing all of NOACA’s existing GIS data and transportation modelling systems, identifying and acquiring any additional data for each scenario tool, developing an intuitive map-based interface, programming numerous custom spatial analysis tools, and developing an API for scaling to external systems. Named DART, short for Data Analysis and Reporting Tool, the framework combines SQL spatial databases, Esri programming APIs, ArcGIS Server, and integration with the Esri online platform and NOACA’s existing ArcGIS Online maps. Five categories of scenario analysis tools were developed based on tenets of NOACA’s mission: Preserving Existing Infrastructure, Strengthening Regional Cohesion, Supporting Economic Development, Enhancing Quality of Life, and Building Sustainable Multimodal Transportation. 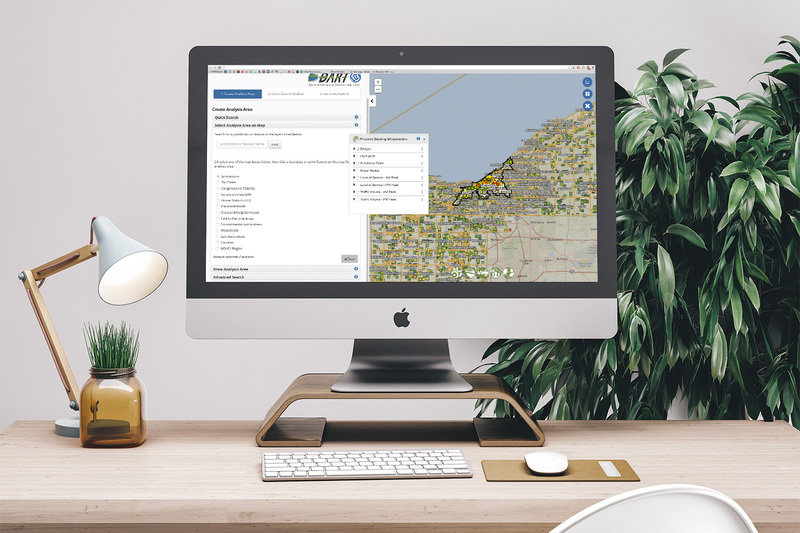 While interacting with the framework, users begin by creating a study area on a web map, either by selecting from existing planning area boundaries or drawing their own area. Next, they select from a menu of datasets and analysis tools. The geometry of the study is passed to the backend queries and model, and results are displayed in reports and map visualizations. Results can be printed, and data can be downloaded for further study. Over 45 spatial datasets, plus a block group level demographics database, are used for the analysis tools. A library of spatial queries, processing models, and real-time map rendering functions were developed for aggregating and analyzing every spatial data set. 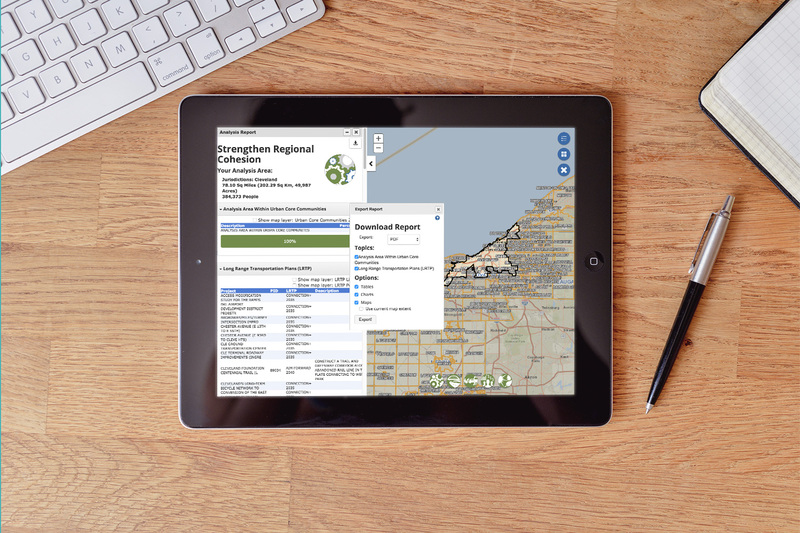 A custom API supports scalability and integration with other systems and GIS applications.